With exceptional levels of comfort and durability, this colourful FunAqua girls Abstract Swimsuit is an ideal choice for any young swimmers seeking a fresh new look for training or regular pool use. 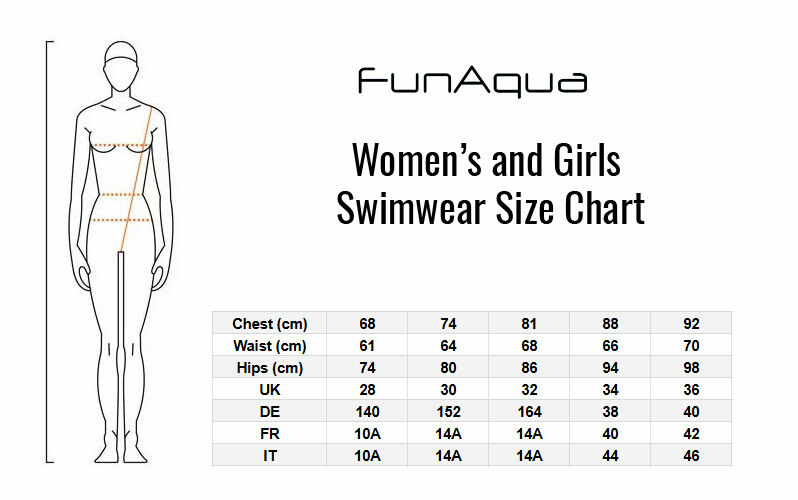 The stylish Abstract pattern is one of FunAqua's newest designs, and this swimsuit is made from a high quality chlorine-resistant fabric that will prevent fading while keeping it looking and feeling as good as new for longer. If you're looking for a bright and fun new look for your swim sessions, the FunAqua girls Abstract swimsuit is a perfect choice. With a combination of comfort and durability, this girls swimming costume is perfect for swim training or regular pool use and features a colourful new Abstract pattern which is one of FunAqua's newest designs. Made from a high quality polyester fabric, this swimming costume is chlorine-resistant and offers UV protection to retain its colourful appearance while looking and feeling like new for longer. The two-way stretch fabric ensures a perfect fit time and time again, and its thin-strap openback design provides exceptional flexibility in the shoulders to help you take on any drill. Bright, fun, quick-drying and long-lasting, the FunAqua Abstract is everything you could wish for from a training swimsuit.